Who led the Crusade ? "Kill Them All ... "
Do Cathars still exist ? 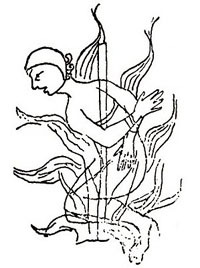 The following text is an English translation of an extract from Bernard Gui's Practica inquisitionis heretice pravitatis or "Conduct of the Inquisition into Heretical Wickedness". Gui was Inquisitor in Toulouse from 1307 to 1323. Here he describes the techniques used in interrogations. This translation is taken from H. C. Lea, A History of the Inquisition of the Middle Ages, (New York, Harper & Brothers, 1887), Vol. 1, pp. 411-414. The extract comes from chapter II §7 of Gui's work, which deals specifically with Waldensians. Other extracts concerning the examination of suspected Cathars are cited elsewhere on this website. a fuller translation is given by Wakefield & Evans, Heresies of the High Middle Ages, 55 (Bernard Gui's Description of Heresies). When a heretic is first brought up for examination, he assumes a confident air, as though secure in his innocence. I ask him why he has been brought before me. He replies, smiling and courteous, "Sir, I would be glad to learn the cause from you." I [Inquisitor]: You are accused as a heretic, and that you believe and teach otherwise than Holy Church believes. A. (Raising his eyes to heaven, with an air of the greatest faith) Lord, thou knowest that I am innocent of this, and that I never held any faith other than that of true Christianity. Waldensians, like Cathars, could claim with a clear conscience that they were true Christians. I [Inquisitor]: You call your faith Christian, for you consider ours as false and heretical. But I ask whether you have ever believed as true another faith than that which the Roman Church holds to be true? A. I believe the true faith which the Roman Church believes, and which you openly preach to us. I [Inquisitor]: Perhaps you have some of your sect at Rome whom you call the Roman Church. I, when I preach, say many things, some of which are common to us both, as that God liveth, and you believe some of what I preach. Nevertheless you may be a heretic in not believing other matters which are to be believed. A. I believe all things that a Christian should believe. I [Inquisitor]: I know your tricks. What the members of your sect believe you hold to be that which a Christian should believe. But we waste time in this fencing. Say simply, Do you believe in one God the Father, and the Son, and the Holy Ghost? I [Inquisitor]: Do you believe in Christ born of the Virgin, suffered, risen, and ascended to heaven? Waldensians had started off with orthodox Catholic beliefs, but as they suffered persecution they started to doubt many claims of the Catholic Church - exactly the same claims that Protestants would question centuries later. I [Inquisitor]: Do you believe the bread and wine in the mass performed by the priests to be changed into the body and blood of Christ by divine virtue? A. Ought I not to believe this? The doctrine of Transubstantiation was doubled by Cathars, Waldensians and many other Christian groups, as it still is. I [Inquisitor]: I don't ask if you ought to believe, but if you do believe. A. I believe whatever you and other good doctors order me to believe. I [Inquisitor]: Those good doctors are the masters of your sect; if I accord with them you believe with me; if not, not. A I willingly believe with you if you teach what is good to me. I [Inquisitor]: You consider it good to you if I teach what your other masters teach. Say, then, do you believe the body of our Lord, Jesus Christ to be in the altar? A. (Promptly) I believe that a body is there, and that all bodies are of our Lord. I [Inquisitor]: I ask whether the body there is of the Lord who was born of the Virgin, hung on the cross, arose from the dead, ascended, etc. A. And you, sir, do you not believe it? I [Inquisitor]: I believe it wholly. I [Inquisitor]: You believe that I believe it, which is not what I ask, but whether you believe it. A. If you wish to interpret all that I say otherwise than simply and plainly, then I don't know what to say. I am a simple and ignorant man. Pray don't catch me in my words. I [Inquisitor]: If you are simple, answer simply, without evasions. I [Inquisitor]: Will you then swear that you have never learned anything contrary to the faith which we hold to be true? A. (Growing pale) If I ought to swear, I will willingly swear. I [Inquisitor]: I don't ask whether you ought, but whether you will swear. A. If you order me to swear, I will swear. I [Inquisitor]: I don't force you to swear, because as you believe oaths to be unlawful, you will transfer the sin to me who forced you; but if you will swear, I will hear it. A. Why should I swear if you do not order me to? I [Inquisitor]: So that you may remove the suspicion of being a heretic. A. Sir, I do not know how unless you teach me. I [Inquisitor]: If I had to swear, I would raise my hand and spread my fingers and say, "So help me God, I have never learned heresy or believed what is contrary to the true faith." Then trembling as if he cannot repeat the form, he will stumble along as though speaking for himself or for another, so that there is not an absolute form of oath and yet he may be thought to have sworn. If the words are there, they are so turned around that he does not swear and yet appears to have sworn. Or he converts the oath into a form of prayer, as "God help me that I am not a heretic or the like"; and when asked whether he had sworn, he will say: "Did you not hear me swear?" [And when further hard pressed he will appeal, saying] "Sir, if I have done amiss in aught, I will willingly bear the penance, only help me to avoid the infamy of which I am accused though malice and without fault of mine." But a vigorous Inquisitor must not allow himself to be worked upon in this way, but proceed firmly till he make these people confess their error, or at least publicly abjure heresy, so that if they are subsequently found to have sworn falsely, he can without further hearing, abandon them to the secular arm". The point here is that Waldensians (like Cathars) would not swear in any circumstances - something the Inquisitor could have established in a single question. To "abandon them to the secular arm" is a euphemism for condemning the accused to be burned alive. Accused heretics were not normally burned for a "first offence" as long as they recanted and repented. Gui is keen that Inquisitors should not miss the opportunity for a later kill by failing to record the admission of first offenders. Gui's approach to the equivocation of suspects brought before him is interesting to contrast with the Roman Church's approach to the same question when Roman Catholics in England were suspected of treason in Tudor times. Routine, rehearsed equivocation was so widely practiced by Jesuits that it gave us the word Jesuitical to denote extreme equivocation. 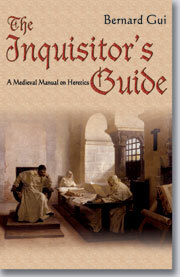 Gui's work goes under a number of names such as The Inquisitors' Manual and the Inquisitors' Guide. It has been translated by Janet Shirley and is available through Amazon. Selected Cathar Castles. Accommodation provided. Transport Provided. Author: James McDonald MA, MSc.